A true classic, I Heard It Through The Grapevine, was written in 1966 by Norman Whitfield and Barrett Strong for Motown. The song was originally recorded by Smokey Robinson & The Miracles. The version was deemed not strong enough by Barry Gordy and given to Marvin Gaye, who recorded it in 1967. Gordy did not like this version either and it was then recorded by Gladys Knight and the Pips, who also released it in 1967. The Smokey Robinson version was not released for many years, and Gaye’s was not released until 1968. as far as covers, wow, diverse groups like CCR and the California Raisins (a TV commercial with Buddy Miles as the vocalist) have given the song a makeover. 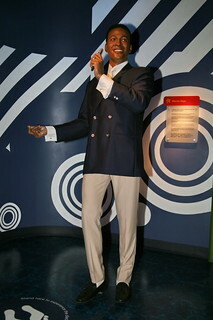 Third, the classic Marvin Gaye. These were the basic originals, now we will listen to some covers from later on. This is the song done by Creedence Clearwater Revival, not the 10 minute version. And to finish up, a version by the British punkers, The Slits. This could qualify as an Interesting Cover. Which reminds me, I should post a new one of those. Time is our enemy at times isn’t it. Today’s offering, presented for your approval, is a live version of a cover by Luke Doucet of a classic Cure tune, “The Lovecats“. Great song, and a great version. 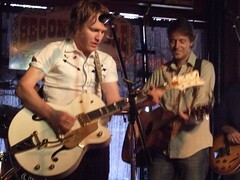 Luke Doucet is another of those Canadian talents that we kind of keep as a secret from the rest of the world. He is everywhere on Canadian radio, teaming up with Danny Michel, or playing with Whitehorse (a duo with Melissa McLelland) or playing on his own. Enjoy! Three very different takes on this classic. 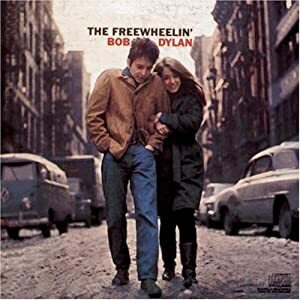 The original was written by Bob Dylan in 1962 and appears on his second album, “The Freewheelin’ Bob Dylan“. It was first performed by Dylan at Carnegie Hall in 1962. Over the years it has been recorded many times by a wide and varied array of talent. Dylan himself has redone the song several times, most recently in 2007. I have touched on this diversity with what I believe are some pretty different versions, and finished off with the original. First up, a version by Roxy Music‘s Bryan Ferry. As expected, it is different. He recorded it in 1973 on “These Foolish Things” where he did a raft of covers. Jason Mraz performed this song on “Listen To Bob Dylan: a Tribute”. Another slightly different take done in the Mraz style. Nicely done. And of course the original. Interesting covers goes old-time. Today we look at a milestone song “Hound Dog“. It was written by the legendary team of Jerry Lieber and Mike Stoller in 1952 after meeting and hearing Willie Mae (Big Mama) Thornton. The meeting had been arranged by Johnny Otis. They were 19 at the time, unbelievable. 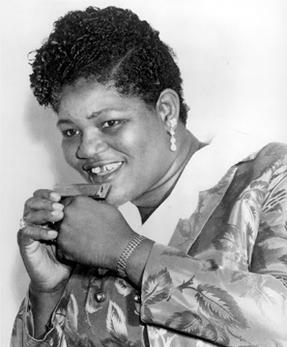 Big Mama Thornton was the first to record it (August 1952) and released it in February 1953. It was her only hit, but the song, well that’s a different story altogether. It has been covered over 85 times and charted on several of those incarnations, although none had the success of either Big mama’s or Elvis Presley’s versions. The Elvis version is obviously the best known and placed at 19 on Rolling Stones Top 500 of all time, not to mention being in the Grammy’s Hall of Fame. Who has covered it you ask? A veritable who’s who of music and reflecting a wide diversity of style. Jerry Lee Lewis, Pat Boone, John Lennon, Jimi Hendrix, Conway Twitty, Eric Clapton, James Taylor and Frank Zappa. Crazy! We will dispense with the poll on this, seems the work involved is not worth the 1 vote each time hahaha. We’ll start with Big Mama, move through a couple of others and finish up with Elvis. Enjoy! The Big Mama version is very much R&B and a lot less frenetic than the more familiar Elvis effort. I like the voice and her control of the song. The instrumentation is subtly performed by some very good musicians. A great song done like this. This version is by one of my favourites, John Lennon. Unfortunately, the song is not up to his standards, ruined by some “singing?” by Yoko doing her best imitations of a dog. Kind of funny to listen to and watch. Some good playing though. Here is the Jimi Hendrix version, unmistakably his.